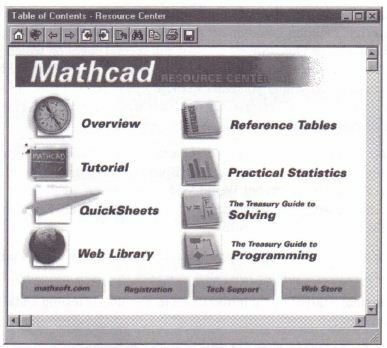 If you learn best from examples, want information you can put to work immediately in your Mathcad worksheets, or wish to access any page on the World Wide Web from within Mathcad, choose Resource Center from the Help menu. You will see a Mathcad Electronic Book in a custom window with its own tool bar, as shown in Figure 2-2. Mathcad Standard or other editions differ slightly. • Choose Collaboratory from the File menu. • Check the list of forums in the upper left comer of the dialog box. Click on the forum containing the topic you want to delete. • Once you’ve selected the forum, click on the topic you want to delete. The topics are in the scrolling list at the upper right comer of the dialog box. After you confirm that you want to delete the topic, you’ll see your topic disappear from the Topics window on the upper right comer of the dialog box. Note that if your fIle or message has received any responses, you won’t be able to delete it. • A comprehensive Mathcad Electronic Book containing a collection of tutorials, examples, and reference information. Simply drag and drop information from the Resource Center into your own Mathcad worksheets. 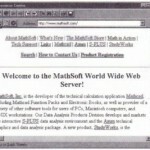 • Immediate access to Mathcad worksheets on MathSoft’s World Wide Web site or other Internet sites. 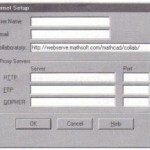 • Access to the full Web-browsing functionality of Microsoft Internet Explorer from within the Mathcad environment. • Overview. A high level introduction to Mathcad’s computational features. • Tutorial. Step-by-step guidance for new users on creating math, text, and graphics regions. • Reference Tables. Look up physical constants, chemical and physical data, and mathematical formulas you can use in your Mathcad worksheets. • Practical Statistics. An introduction to hypothesis testing and data analysis in Mathcad. • The Treasury Guide to Programming. 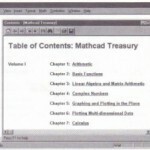 In-depth discussion of programming operators and programming techniques in Mathcad Professional, also excerpted from The Mathcad Treasury.